Sea surface temperature anomalies of the NINO3.4 region really don’t do justice to the 1997/98 El Niño. That El Niño was freakish in how quickly it evolved in the eastern (not central) equatorial Pacific and how warm the sea surface temperatures eventually grew there. We can use the sea surface temperature anomalies of the NINO1+2 region to illustrate this. See Figure 2. The NINO1+2 region is bordered by the coordinates of 10S-0, 90W-80W. It’s just west east and south of the Galapagos Islands. Bob, I mentioned to you some years back the deep interest that those of us in the grain market research business have in your stuff concerning ENSO, but not concerning its connections with land/ocean temp anomalies so much as with the various intercontinental “teleconnections” claimed by NOAA for ENSO, and our own efforts to make correlations with grain yield changes in the major regions of interest—the US cornbelt, Ukraine, Argentina, and Brazil. I am certain that if you added this focus, you would become exposed to a larger group of researchers who can pay for things, as opposed only to those with an anti-AGW hobby. You might want to look at Roy Spencer’s blog of March 18, 2014, which mentions my company and uses one of my charts. If you want to examine this further, please contact me by direct email, and I will reply with sample reports. 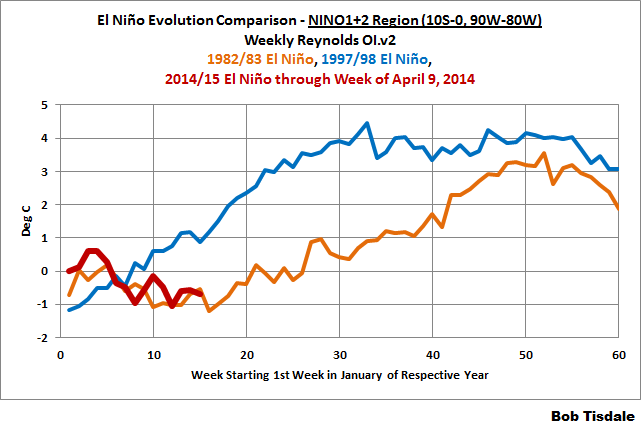 Your current analysis that the emerging 2014 El Nino is more like 82-83 than 97-98 is of keen interest. Bill Hudson, thanks for the idea. Right now my plate is full, but I’ll take a look and see if I can be of value. No way to compare events. Yet, this multi part article seems to keep comparing events to let everyone know its not like the 97/98 and its more like 82/83 (comparison). There’s not enough historical data to make comparisons of any sort on El Nino events except for the timing of the development and the wind anomalies associated with development. Actual ocean reactions are not able to be accurately forecasted yet. Let those other articles be. Focus on what you know. FYI in 97′ there was a large area of cool surface water west of the 1+2 region that doesn’t exist with this event. Fact is that everything is setup. now we need one more significant wwb to cause development we saw in 97′. There is plenty of time for this to grow into a monster possibly and we are seeing some reversal in trade winds at the moment over the Western Pacific. If you look back at the link below and notice the development between now and mid-May it was explosive. If that was to start in even July we would see an usually strong El Nino. We’re in the most interesting time of this event and I look forward to future post. I agree that there’s no way to compare events. And sorry if I gave the wrong impression. It’s not my intent to let anyone believe that the upcoming event will be more like the 1982/83 E Nino than the 1997/98 El Nino. I present data. I don’t make predictions. The data disagree with you. Sea surface temperature anomalies for the NINO3 region (just west of the NINO1+2 region) this year dropped down temporarily below the 1997 values. And yes, it will be interesting to watch this develop. I have just ’discovered’ your blog recently, but I like the clarity of your conceptual models for El Niño and La Niña. Your commitment to remain evidence driven is also very commendable. 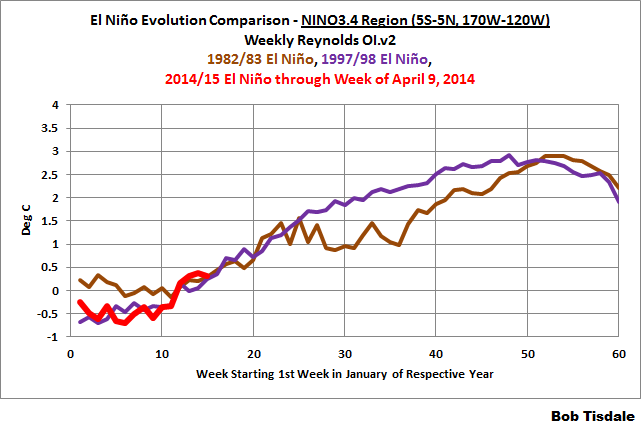 What can be said about the currently developing El Niño on the basis of the preceding Niñas? What do we know about heat stored in that preceding phase with all the ARGO infrastructure? The ARGO floats are helpful for the tropical Pacific, but they’ve only been in place for a decade. 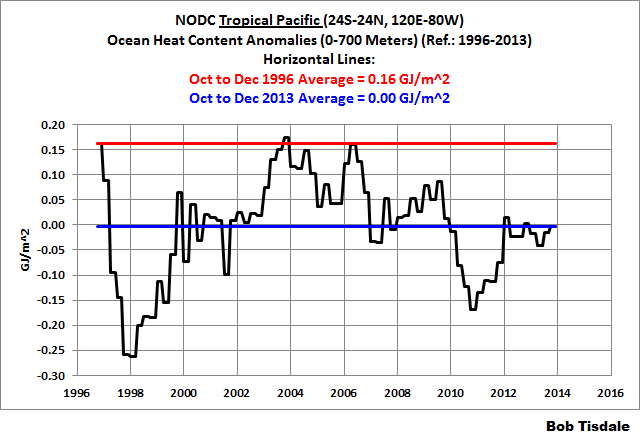 Luckily, the TAO Project floats have been fully in place in the equatorial Pacific since the early 1990s. 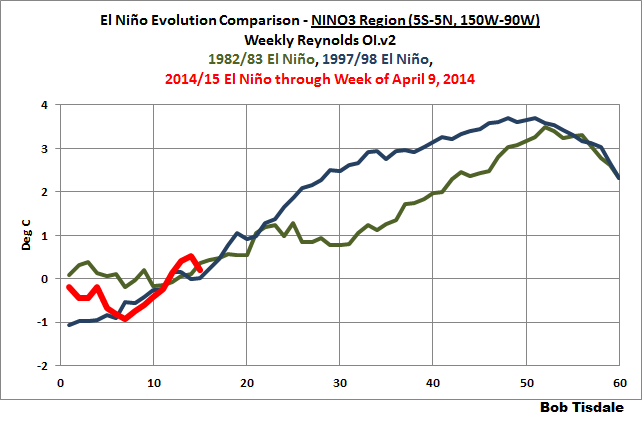 The La Ninas that trailed the 2009/10 El Nino replaced some of the heat released by that El Nino, but not all of it.